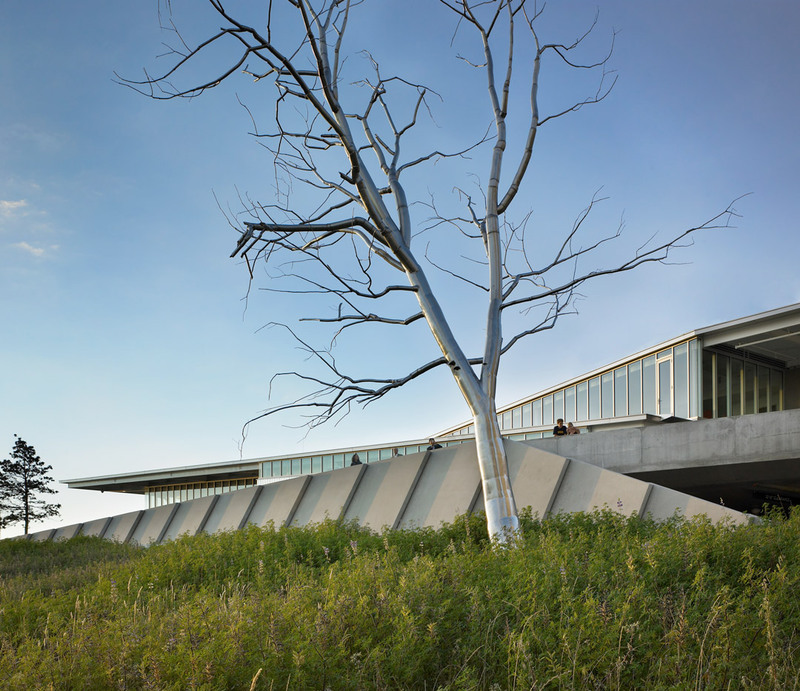 Roxy Paine’s polished stainless steel tree Split rises fifty feet high above SAM’s Olympic Sculpture Park, brazenly confronting its natural surroundings with its own manmade-ness. In many ways, Split embodies contrast. Smooth and reflective, it rejects the rough texture and earthy brown color of tree bark. There is an immediately recognizable contrast between its machine-age manufacturing and the organic growth process of trees, a juxtaposition heightened by the earth on which Split is installed. Within the work itself, Paine has built up the sculpture in such a way that its two main limbs diverge, heading in opposite directions, as if visualizing some internal conflict in the tree, like two camps of its cells decided their differences were irreconcilable and they roughly parted ways. Nearby, in Neukom Vivarium, a nurse log gives birth to life in varied forms while the log itself decays—a celebration of natural regenerative processes that have been occurring for a long time. In Split, we see something quite different, as the artist confronts us with our views and actions related to art, nature, and beauty, in a relatively new world of industrial production. Yet Split shares with its woody neighbors a common tree-ness. Its form tells us straight away that it represents a tree. Though made, not grown, it, too, had to be planted. The act of planting a tree holds a special significance. It is a generative act, one that makes a positive contribution to the landscape in the form of an oxygen-producing, eye-pleasing, life-giving organism. One factor that makes it special is the longevity of the reward. Planting a tree requires the investment of a certain amount of time and labor, but we have a sense that it’s well worth it because trees last (longer than us, often). The lifespan of the tree, and the richness of the reward for planting it, overwhelms any cost. Good vibes attend the planting of a tree because we have a sense that what we’re doing will benefit so many folks beyond ourselves. Here’s another rewarding quality to planting a tree: our investment multiplies. We can’t exactly watch it happen, but with patience, over time, we can mark a tree’s growth. The payoff continually increases. This is the ecological equivalent to putting away savings. In 2017 SAM will celebrate the 10th anniversary of the Olympic Sculpture Park, itself a remarkable contribution to Seattle, and home to important works like Split. Moving from one year to the next always provides a chance to reflect on transitions and trajectories, and after this turbulent year, that seems especially the case. As we turn over a collective new leaf at SAM, in our city, in our country, and in our world, my hope is that we remember the value of planting, of making positive additions, each of us in our own unique way. 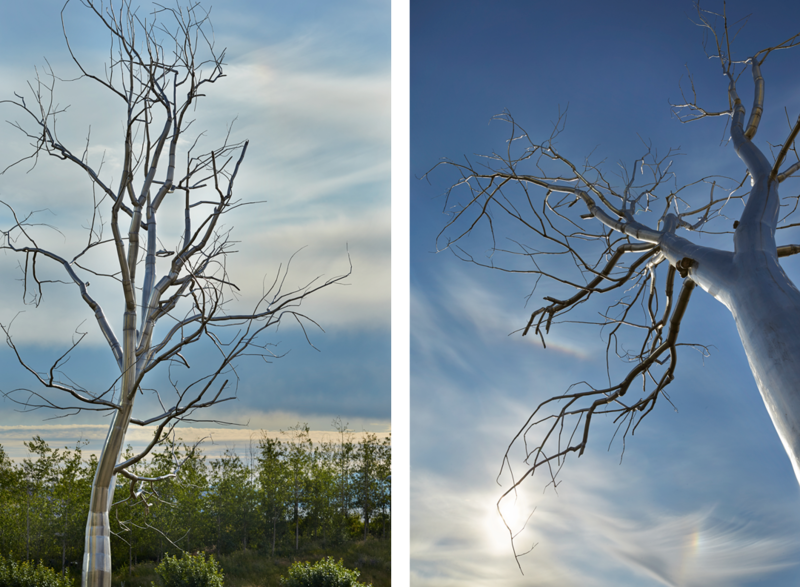 Images: Split, 2003, Roxy Paine (American, b. 1966), polished stainless steel, height: 50 ft. Seattle Art Museum, Gift of the Virginia and Bagley Wright Collection, in honor of the 75th Anniversary of the Seattle Art Museum, 2016.17.3, © Roxy Paine, Photos: Benjamin Benschneider.